We love industry honors . . . and changing the world just a little bit. Often our customers will thank us for a job well done, or for going above and beyond with our customer service, and we always appreciate that. But there’s something extra special about being honored by your peers. 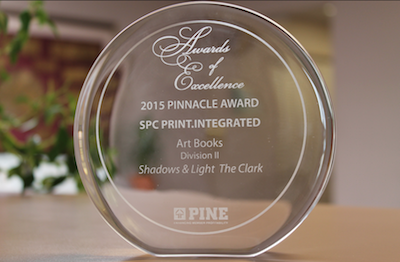 The Printing Industries of New England (PINE), a major trade group that has been around in one form or another since 1887, recently presented us with three awards as part of their 2015 Awards of Excellence Competition. The competition is stiff; we were up against 40 companies from all over New England, who submitted over 300 entries. We’re very proud that our quality work and attention to detail impressed the judges. The visitors’ center at the Clark Art Institute in Williamstown, Massachusetts was designed by Tadao Ando, a winner of the prestigious Pritzker Prize. When noted architectural photographer Richard Pare decided to create a book of 60 stunning photographs of the Clark, designed by David Edge, Springfield got the call. The result was the Pinnacle Award, the top prize for all art books for Shadows & Light: Tadao Ando at the Clark. Wow! We also picked up Awards of Recognition for Hard Cover Books for The Bodies of Mothers: A Beautiful Body Project and for Catalogue/Service, Four Colors or More for Brooklyn Historical Society. We’re especially proud of the former, for a couple of reasons. First, it was published by a Vermont publisher, and we love to partner with our neighbors. So do they; part of their mission is to print their books in Vermont, using 100% post-consumer waste paper, and they knew that Springfield offers recycled products certified by the Forest Stewardship Council. Books with no trees! They’re also committed to publishing the work of local writers, writers who care about the world around them. In fact, their mission is “Giving voice to writers who will make the world a better place.” It doesn’t get any better than that—except maybe when you win an award for it! We’re also pleased that the aim of The Bodies of Mothers is to reshape images of women in mass media and to inspire future generations of women to embrace their beauty just as they are. We think that’s important. In the end—and we’re almost there—it’s great to win awards, but it’s even greater to be part of a community that works together to make the world a better place, whether it’s through empowering women, sharing great architecture, or supporting an important institution like the Brooklyn Historical Society. And that’s why every single print job is important to us. Because you never know what’s going to make the world a better place, in ways that are small and large.